Here are a few case studies on our work we would like to share with you. We cleared the area but were asked to retain an existing incline toward the back fence as children liked to roll down this during break times. 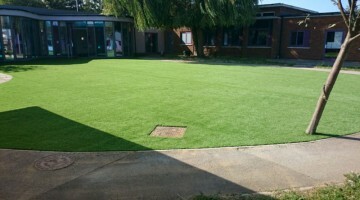 Simply stripping the top of turf was not enough and we used a digger to remould the incline and make it shallower and more child-friendly. 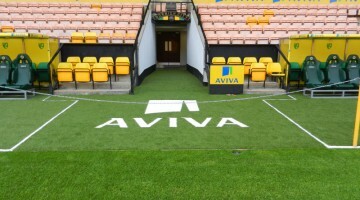 Norwich City Football Club commissioned our artificial grass for an area of their Carrow Road ground around the dug outs and up to the pitch, a well-used area on which players run during every home game. When we arrived on this job we could tell it was going to be a huge transformation. 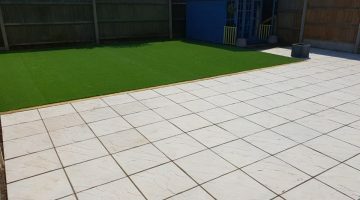 Our client requested brand new slabs to be installed as well as our gorgeous Fiji artificial grass. 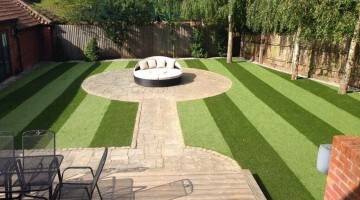 The brief for this installation at the home of former Norwich City football star Darren Huckerby was to install our artificial grass in a striped Wembley effect across the entire garden. We were helped by the pile direction of the chosen grass.